The event gathered the attendance of French experts, leaders, senior managers and businesses in the urban development fields of architecture, transport, energy, waste management, and water treatment. In the past decades, France has been committed to supporting Vietnam through the implementation of capacity building projects and the provision of tools in the sphere of urban planning and management, sustainable growth, and improvement of quality of life in cities. Addressing the forum, Tran Vinh Tuyen, vice chairman of the HCM City People’s Committee, stated that the city has implemented a project on developing HCM City into a smart municipality in the 2017-2025 period, with a vision to 2030. The project will serve three major subjects. As for the municipal authorities, a smart city will focus on building e-government resources and laying the foundation for information and data connection and sharing to increase the efficiency of state management across all spheres. As for businesses, smart cities will offer a transparent, simple and favorable environment for companies, thereby creating competitive advantages for them compared to other regions, while helping to attract greater investment to the city. As for the people, a smart city strengthens interaction between the authorities and local people, while enhancing utilities in service of the people. At the forum, the HCM City People’s Committee and the Consulate General of France signed a memorandum of understanding on air quality control cooperation. 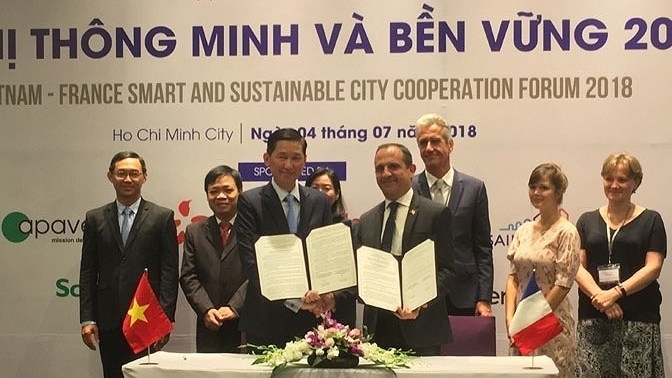 Accordingly, the contents of the cooperation agreement will help HCM City to accelerate environmental pollution control and reduction, contributing to ensuring the sustainable development of the city as a green and modern municipality.